This week marks the beginning of a critical step in creating the JUST Capital rankings of the largest companies in the United States – the corporate data review process. Our polling and research teams have been hard at work over the past couple months, gathering data – including company reports, 10-K filings, crowd-sourced Glassdoor findings, and other sources – based on the priorities the American people shared with us during our survey work. 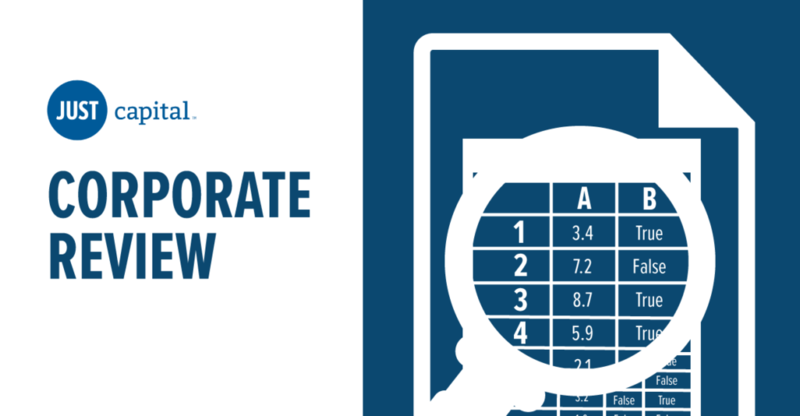 From June 12 to July 31, all the corporations we’ll be ranking have the opportunity to login to our secure Corporate Portal to review the data we’ve collected on their companies, to ensure that the data collected by our research team is as accurate as possible. Our research team conducts a rigorous review process, but there are instances where companies have not published data for a certain metric, or where information publicly available is out-of-date. In these cases, it’s essential that these companies have the opportunity to provide, correct, or verify the data we’ve collected. Ultimately, JUST Capital seeks to build a more just marketplace, and we can’t do that without communicating and working with the corporations we rank. We’ve instituted this corporate review process in an effort to create not only accuracy, but transparency. It’s our hope that, armed with the rankings, and a detailed understanding of our methodology and research, corporations will work to establish more just processes and systems. JUST Capital will publish its full ranking of the Russell 1000 in Forbes Magazine later this year. The “Most JUST Companies in America” list will include all industries and rankings based on our survey of the American people and what they let us know was most important to them when it comes to just corporate behavior. In the meantime, we look to corporations to use our Corporate Portal to help us build the most accurate and comprehensive rankings possible. The JUST Capital Corporate Portal will be live June 12 through July 31. For questions about access for companies, please e-mail corpengage@justcapital.com.